This letter was written by 28 year-old Sgt. Charles H. Palmetier (1834-1901), a mechanic from Geneva, Wisconsin. 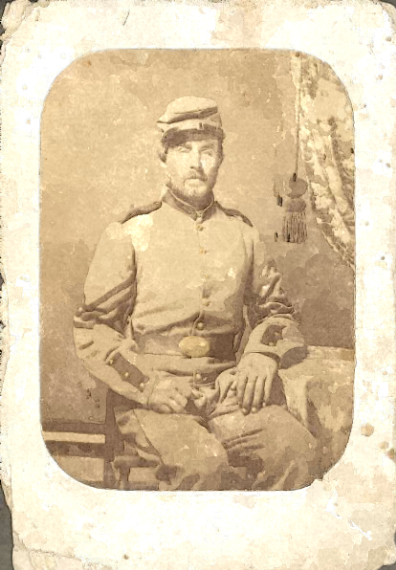 Charles enlisted in Co. K, 8th Wisconsin Infantry in September 1861. 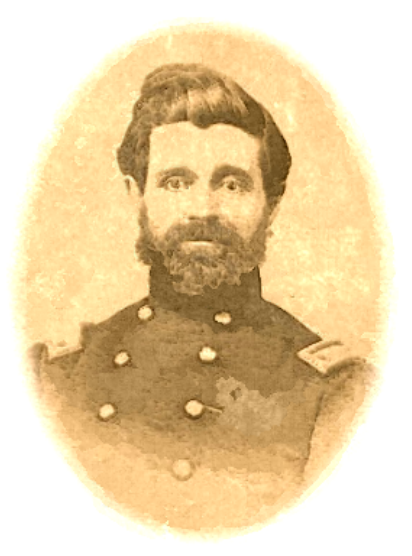 He was promoted to 2nd Lieutenant in September 1862 in recognition for his bravery at the Battle of Corinth. He participated with his regiment in the battles at Frederickstown, Farmington, Corinth, Iuka, the siege of Vicksburg, and all other skirmishes of the famed “Eagle Regiment” before being mustered out of the service in September 1865 at Demopolis, Alabama. In the letter, Charles mentions sending his gray uniform home “for the boys to wear on the farm.” In 1861, the Northern states purchased their own uniforms and Wisconsin selected grey, possibly because it was the color uniforms of the New York militia where Wisconsin purchased the majority of its uniforms. Not until the fall of 1861 did blue become the standard color for Union troops. Charles was born in Catskill, Green County, New York in December 1834. He came to Geneva, Wisconsin in 1847 and became a lumber dealer. After the war, Charles held various local offices as school director, chairman of the town board, etc. & was a delegate to the National Convention at Chicago in 1880. He was elected a Wisconsin State Senator in 1882 and 1883. 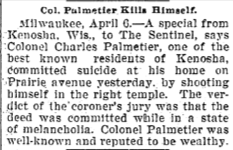 Tragically, Charles Palmetier committed suicide in 1901 while residing in Kenosha, Wisconsin. Charles sent the letter to his older brother, Isaac Hegeman Palmetier (1832-1874), a farmer in Walworth County, Wisconsin. They were the sons of Lawrence Palmetier (1802-1891) and Mary Manning (1804-1886) of Walworth County, Wisconsin. Isaac was married to a woman named Carrie (b. 1841). Charles wrote this letter from Birds Point which was an encampment on an island in Missouri near the confluence of the Ohio and Mississippi Rivers opposite Cairo, Illinois. I seat myself to inform you that we still live to move but have no beings we left Mound City morning at eight o’clock but where we didn’t know. But about nine o’clock we arrived at Cairo & there we got orders to go to Birds Point & await further orders. And here we are — all feeling first rate & have got good quarters. I think we will join the regiment in a few days. A part of the 15th Regiment Wisconsin Volunteers are here doing guard duty. The weather is remarkable fine & the mud is about dried up. The Ohio & Mississippi Rivers are both very high & the prospect is that we are going to get drownded out if the keep on rising a few days longer. No news of any importance from Island No. Ten. When you write, you had better direct [to] Cairo, 8th Regiment as before, in care of Capt. [William Penn] Lyon. We packed our old clothes & sent them by express. I sent three coats, two pairs of pants, one pair of overshoes, & one pair of gloves & one sesesh bridal for you. We either had to throw them away or give them away & we thought we would send them home. I thought they would be good for the boys to wear on the farm. It is against the orders to wear grey uniforms in the field. I have not had any letters in some time. Our mail all goes to the regiment & then has to be sent back & lately it has been neglected for some reason. Carrie, you must take good care of my clothes for I think they will come in play when I get home for I do not think the ball is run to kill me. Tell Mrs. Brown that I saw her brother when I was at Island No. Ten. He was there taking notes for the papers. My best respect to all that enquire after my welfare. This entry was posted on Sunday, August 31st, 2014 at 12:00 pm	and posted in Uncategorized. You can follow any responses to this entry through the RSS 2.0 feed.